Here's two recipes in one! Both the arancinis and ragu can be made as separate dishes - but why would you want to? They go so well together! 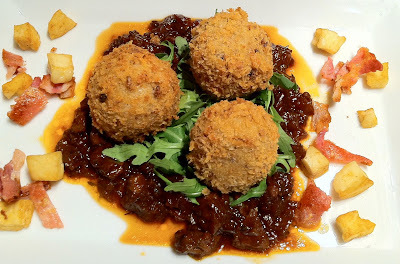 Creamy risotto balls on a rich meaty ragu, perfect with a large glass of full bodied red wine! Top tip: The ragu can be quite sweet, so I serve it with some grilled halloumi and fried pancetta to counter balance the flavours, and to add texture to the dish. 1. Start by making the ragu. Roughly chop the leek, onion, carrot and garlic. Place in food processor and pulse 3 or 4 times until well chopped. 2. In a frying pan add the butter and melt. Chop the lamb into 1cm squared pieces, brown the lamb all over in the pan, and add the chopped vegetables. Mix in the coriander seeds, thyme and cloves and sauté for a further 2 mins. 3. Transfer the lamb and vegetables to a casserole dish, and then add the honey, soy, vinegar, and sherry. Heat and reduce until thickened and sticky, over a medium flame. 4. Add the stock to just about cover (keep some stock aside in case you need to top it up whilst cooking), and then mix in the tomato purée. Cover the dish and place in the oven at 180 degrees Celsius for an hour or until the lamb is very tender. It should just melt in your mouth! Don't forget to remove cloves and thyme branch before serving. 5. While the ragu is cooking you can make the arancinis. Start by chopping the shallots and garlic, and put the mushrooms in food processor and whizz into large breadcrumb size. 6. Sauté the shallots and garlic in the oil, then add the mushrooms and sauté for a further minute. Add the risotto rice and heat through until clear-ish. 7. Add the brandy and heat for a further minute before adding the chicken stock bit by bit, allowing to reduce between additions. Once cooked melt a little of the Roquefort into the risotto and stir through. 8. Allow the risotto to cool before placing a small amount (1tbsp) in the palm of you hand. Press a square of Roquefort (1cm) and a square of butter into the risotto and then place another tablespoon of risotto on top. Roll the lot into a ball, with the cheese and butter in the center. Repeat with the remaining risotto. 9. Make the bread crumb mix by placing the sliced bread bit by bit into a food processor and mix well. Add a handful of grated parmesan, 1 tsp of ground nutmeg and season well with salt and pepper. 10. Whisk the two eggs in a bowl, roll each risotto ball in the egg mix to coat, then roll into the breadcrumbs mix so the balls are well coated. Deep fry in oil until golden brown. Serve with grilled halloumi and fried pancetta pieces.